For all ¾ CAV members who are not yet aware, we’ve all recently lost a good friend. Craig Peterson from Delta Troop passed away recently due to complications after having knee replacement surgery at the Minneapolis VA hospital. Craig served two tours as a helicopter pilot in Viet Nam and was single-handedly responsible for evacuating the many killed and all of the known wounded personnel at FSB Schofield on the night of August 24, 1968. Due to the ferocity of the battle, dust-off support from the 25th Aviation Battalion, which had in the past routinely provided medical evacuations to the ¾ CAV as well as other field combat units, was denied to the besieged combatants at FSB Schofield. Having been assaulted by heavy weapons fire and human wave attacks, the 25th Aviation command would not allow their ships or crews to enter the hostile combat zone. There were many killed during the firefight and many of the wounded needed immediate medical attention due to the severity of their wounds or they would have perished. However, our Delta Troop pilots were not under the command of the 25th Aviation Battalion. They were a part of the ¾ CAV and they always came when they were called, even when others would not. There was only one Delta Troop helicopter pilot assigned to the air that August night and it was our own Craig Peterson. Craig not only made the initial retrieval of dead and wounded at the fire support base, but even after experiencing first hand, the intensity of the battle and upon realizing that any subsequent attempts to land within the fire support base would pose a serious risk to his life as well as that of his crew, his bravery and selfless dedication to his fellow troopers showed through when he choose to repeatedly fly into the heat of battle to retrieve all of the dead and wounded who were brought to his chopper for evacuation. The first casualties of the battle were medivaced to the Dau Tieng base camp hospital until Dau Tieng reached full capacity. Craig next evacuated wounded to the hospital at Tay Ninh base camp. When the Tay Ninh facility could no longer accept casualties, Craig evacuated the remaining wounded to the 12th Evac Hospital at Cu Chi, which is where I ended up. If you were involved in that battle, then Craig either medivaced you or one of your buddies and possibly saved their life. It’s estimated that Craig evacuated between 60 and 80 personnel from FSB Schofield, the actual number remains uncertain. However, he was there for us when no one else would come and he was there when we needed him most. Craig was an unassuming individual and always felt that he ‘was just doing his job’, but for many of us, him doing his job is the reason we’re still alive today. He was a hero among heroes. He was the living embodiment of our unit logo, “Paratus et Fidelis”-- Prepared and Loyal! So today, I’m asking all of you for your help in honoring this great American hero. Before Craig passed away an organized effort was underway to attempt to obtain for Craig this nation’s highest award, The Congressional Medal of Honor. During the war in Viet Nam, another dust-off pilot, Major Patrick Henry Brady was awarded the Medal of Honor for evacuating 51 killed and wounded friendly personnel out of harms way. During the Battle of Tay Ninh, on the night of August 24th, 1968, Craig was responsible for evacuating even more personnel than Major Brady evacuated, but since 40 years have passed since the battle took place, its been very difficult to obtain statements in support of his claim from personnel who were actually at the battle and who are aware of the bravery of this man who risked his life to save ours. If you were present during the battle that took place at Fire Support Base Schofield on the night of August 24th, 1968, or if you know of someone who was, you now have a chance to step forward and honor a true American hero. Statements supporting Craig’s heroic actions are needed from those who were present in order to move forward with obtaining his award. If you have something to contribute, however small you feel it may be, please forward your information to this web site using the following email address ATrp3-4Cav@comcast.net and indicate how you may be contacted if follow-up questions need to be asked and also for verification purposes. If you would prefer to have someone contact you so that you can provide your information personally, once again, please write to the above email address and provide your contact information, indicating in your message that you would like to help Craig receive the recognition he deserves, along with how and when you can best be contacted and someone will be in touch with you. You have one last chance to show your gratitude for the sacrifices this great soldier made for those of us who fought our battles on the ground. It’s time to pay your dues. Please step forward along with those who already have and speak up if you can. Craig’s family and your fellow troopers thank you. If you have a story about Craig, want to post a remembrance, or make a comment just select the comment link below. Also you can sign the memorial guestbook for Craig. Show your esprit and loyalty at the next reunion. 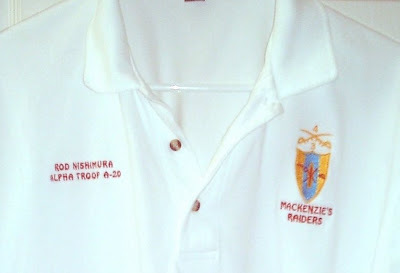 Get a personalized embroidered Alpha Troop 3/4 Cavalry polo shirt. Rod Nishimura has arranged with Casual Wear Unlimited to provide a high quality polo shirt at a reasonable price. Even if you are not attending the next reunion you will want to have one of these shirts. Shirts are white with red lettering and embroidered with a 4th Cavalry unit crest (see photograph).